Juan Ponce de León(Santervás de Campos, Valladolid, Spain). He was one of the first Europeans to arrive to the current U.S. because led the first European expedition to Florida, which he named. 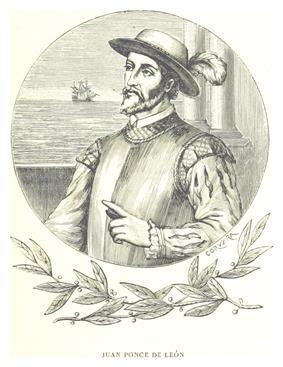 Ponce de León probably was not the first Spaniard to reach Florida, although he was the first to do so with permission from the Spanish crown. Evidence suggests that Spanish raiders from the Caribbean had conducted small secret expeditions to Florida to capture Indian slaves. The native Americans encountered by Ponce de León were hostile at first contact, and he met an Indian in Florida who knew some Spanish words. In 1521, Ponce de León sailed from Cuba with 200 men in two ships to establish a colony on the southwest coast of the Florida peninsula, probably near Charlotte Harbor. However, attacks by the native Calusa drove the colonists away in July 1521. Ponce de León was wounded in a skirmish and died of his injuries upon the expedition's return to Havana. ^ "Exhibit maps Florida history". StAugustine.com. Retrieved 5 April 2015. ^ "Court tries, fails to determine Ponce de Leon’s landing site". palmbeachpost.com. Retrieved 5 April 2015. ^ "History of Methodism in Wisconsin in Four Parts". Mocavo. Retrieved 5 April 2015. ^ "Juan Ponce de Leon - biography - Spanish explorer". Encyclopedia Britannica. Retrieved 5 April 2015. ^ Sauer, Carl Ortwin (1975). Sixteenth Century North America. University of California Press. pp. –196–199. ^ Sauer, Carl Ortwin (1975). Sixteenth Century North America. University of California Press. pp. –199–200. ^ Sauer, Carl Ortwin (1971). Sixteenth-Century North America: The Land and the People As Seen by Europeans. University of California Press. pp. 200–202. Retrieved 5 July 2012. ^ a b c Marley, David (2008). Wars of the Americas: A Chronology of Armed Conflict in the Western Hemisphere (2 Volumes). ABC-CLIO. p. 94. ^ Sauer, Carl Ortwin (1971). 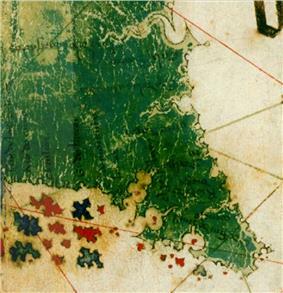 Sixteenth-Century North America: The Land and the People As Seen by Europeans. University of California Press. p. 202. Retrieved 5 July 2012. ^ Marley, David (2008). 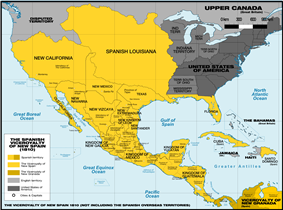 Wars of the Americas: A Chronology of Armed Conflict in the Western Hemisphere (2 Volumes). ABC-CLIO. p. 95. 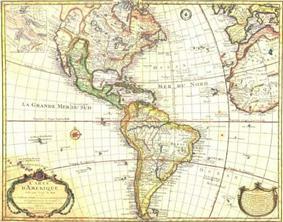 ^ M. McAlister, Lyle Spain and Portugal in the New World, 1492–1700. University of Minnesota Press, 1984. p. 429. ^ a b M. McAlister, Lyle Spain and Portugal in the New World, 1492–1700. University of Minnesota Press, 1984. p. 311. ^ a b Spencer C. Tucker; James R. Arnold; Roberta Wiener (30 September 2011). The Encyclopedia of North American Indian Wars, 1607–1890: A Political, Social, and Military History. ABC-CLIO. p. 954. ^ Rouse, Irving. Survey of Indian River Archaeology. Yale University Publications in Anthropology 45. ^ McEwan, Bonnie. "San Luis de Talimali (or Mission San Luis)". Florida Humanities Council. Retrieved April 13, 2013. ^ Meyers, Christopher C. (April 2008). The empire state of the South: Georgia history in documents and essays. Mercer University Press. pp. 14–15. ^ a b Weber, David J. (27 July 1994). The Spanish frontier in North America. Yale University Press. pp. 277–279. In the early 19th century, Spain offered generous land packages in Florida as a means of attracting settlers, and attracted substantial numbers, both from Spain and from the United States. After settler attacks on Indian towns, Indians based in Florida began raiding U.S. Navy) that became known as the Patriot War of East Florida, and an 1817–1818 campaign against the Seminole by Andrew Jackson that became known as the First Seminole War. Following the war, the United States effectively controlled East Florida. By this time, the United States was also concerned about the armed blacks in Spanish Florida, who became known as the Black Seminoles. Slaveholders wanted to reclaim fugitive slaves, and slave raiders entered the territory. 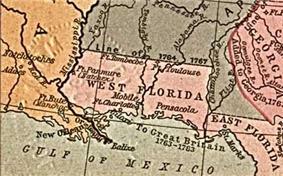 Spain regained possession of the Floridas from Britain in the Peace of Paris of 1783, and continued the British practice of governing the Floridas as separate territories: West Florida and East Florida. In 1763, Spain traded Florida to Great Britain in exchange for control of Havana, Cuba, which had been captured by the British during the Seven Years' War. As Britain had defeated France in the war, it took over all of French Louisiana east of the Mississippi River except for New Orleans. Finding this new territory too vast to govern as a single unit, Britain divided it into two territories separated by the Apalachicola River: East Florida (the peninsula) and West Florida (the panhandle). In February 1647, the Apalachee revolted. The revolt changed the relationship between Spanish authorities and the Apalachee. Following the revolt, Apalachee men were forced to work on public projects in St. Augustine or on Spanish-owned ranches. In 1656, the Timucua rebelled, disrupting the Spanish missions in Florida. This also affected the ranches and food supplies for St. Augustine. The extension of the mission system also provided a military strategic advantage from British troops arriving from the North. During the hundred-plus year span of missionary expansion, disease from the Europeans had a significant impact on the natives, along with the rising power of the French and British. During the Queen Anne's War, the British dismantled much of the missions. By 1706, the missionaries retracted from their mission outposts and returned to St. Augustine. In 1586, English sea captain Sir Francis Drake plundered and burned St. Augustine, including a fortification that was under construction, while returning from raiding Santo Domingo and Cartagena in the Caribbean. His raids exposed Spain's inability to properly defend her settlements. In 1566, the Spanish established the colony of Santa Elena on what is now Parris Island, South Carolina. Juan Pardo led two expeditions (1566-7 and 1567-8) from Santa Elena as far as eastern Tennessee, establishing six temporary forts in interior. The Spanish abandoned Santa Elena and the surrounding area in 1587. At the same time, in response to French activities, King Philip II of Spain appointed Pedro Menéndez de Avilés Adelantado of Florida, with a commission to drive non-Spanish adventurers from all of the land from Newfoundland to St. Joseph Bay (on the north coast of the Gulf of Mexico). Menéndez de Avilés reached Florida at the same time as Ribault in 1565, and established a base at San Agustín (St. Augustine in English), the oldest continuously inhabited European-established settlement in what is now the continental United States. Menéndez de Avilés quickly set out to attack Fort Caroline, traveling overland from St. Augustine. At the same time, Ribault sailed from Fort Caroline, intending to attack St. Augustine from the sea. The French fleet, however, was pushed out to sea and decimated by a squall. Meanwhile, the Spanish overwhelmed the lightly defended Fort Caroline, sparing only the women and children. Some 25 men were able to escape. When the Spanish returned south and found the French shipwreck survivors, Menéndez de Avilés ordered all of the Huguenots executed. The location became known as Matanzas. The establishment of permanent settlements and fortifications in Florida by Spain was in response to the challenge posed by French Florida: French captain Jean Ribault led an expedition to Florida, and established Charlesfort on what is now Parris Island, South Carolina in 1562. However, the Wars of Religion prevented Ribault from returning to resupply the fort, and the men abandoned it. Two years later, René Goulaine de Laudonnière, Ribault's lieutenant on the previous voyage, set out to found a haven for Protestant Huguenot colonists in Florida. He founded Fort Caroline at what is now Jacksonville in July 1564. Once again, however, a resupplying mission by Ribault failed to arrive, threatening the colony. Some mutineers fled Fort Caroline to engage in piracy against Spanish colonies, causing alarm among the Spanish government. Laudonnière nearly abandoned the colony in 1565, but Jean Ribault finally arrived with supplies and new settlers in August. 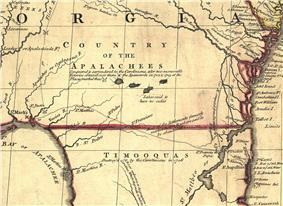 The expedition reached Apalachee in October, and settled into the chief Apalachee town of Alabama. They lost all of their baggage in a fight with Indians near Choctaw Bluff on the Alabama River, and spent the winter in Mississippi. In May 1541 the expedition crossed the Mississippi River and wandered through present-day Arkansas, Missouri and possibly Kansas before spending the winter in Oklahoma. In 1542 the expedition headed back to the Mississippi River, where de Soto died. Three hundred and ten survivors returned from the expedition in 1543.